At the end of December, 1980, my husband was born in a small town in central Alabama to a nurse and a lawyer. On the very same day halfway around the world, another boy was born into a growing family in a small, rural Sudanese village. Three years later, 1983, I came along, the third child to a military family stationed in the Philippines. Meanwhile, my husband was getting used to being a big brother and learning to share. In Sudan, that same boy was being torn away from his family as a vicious civil war broke out, scattering children and parents into the black night, fleeing gunfire and senseless violence. In 1983, I was a Newborn. In 1983, Hubs was a Big Brother. In 1983, Jimmy Makuach was a Lost Boy of Sudan. I was learning how to smile and how to hold my head up. My husband was learning the alphabet and maybe how to spell his name. Jimmy was learning to survive in the thick African wilderness, walking by night, hiding by day, hundreds of miles and even years away from finding refuge. Years later, Jimmy was “adopted” by a church in Maryville, Tennessee, where he attended college, played basketball, and earned his degree. I came to know Jimmy, the boy from Sudan we called Uncle D, through my husband, who was Jimmy’s roommate. We are honored to call Jimmy a close friend. The Sudanese Civil War that displaced thousands of Sudanese, separating over 20,000 children from their families over the span of two decades, came to a tentative end in 2005, when the northern Muslim region and southern Christian region of Sudan formed a volatile peace treaty. On July 9, 2011, southern Sudan declared their independence, now the Republic of South Sudan, becoming a democracy and electing by majority vote Salva Kiir Mayardit as their first president. Our good friend Jimmy, intelligent, well-educated, passionately loyal to his country and envisioned with a brighter future, was appointed President Kiir’s Personal Aid. A couple of weeks ago, we were able to meet with Jimmy, who took time from his American tour, between addressing students at our alma mater and meeting with the United Nations and President Obama in D.C., to have dinner with us. It’s a bit of an understatement to say we are so proud to be counted among his friends. Jimmy is doing amazing, life-changing work in South Sudan, a fragile but determined new country insisting on freedom and restoration and peace. And there is much work to be done, the very least of which is raising worldwide awareness of South Sudan’s steep uphill battle toward self-sufficiency and global reputation. 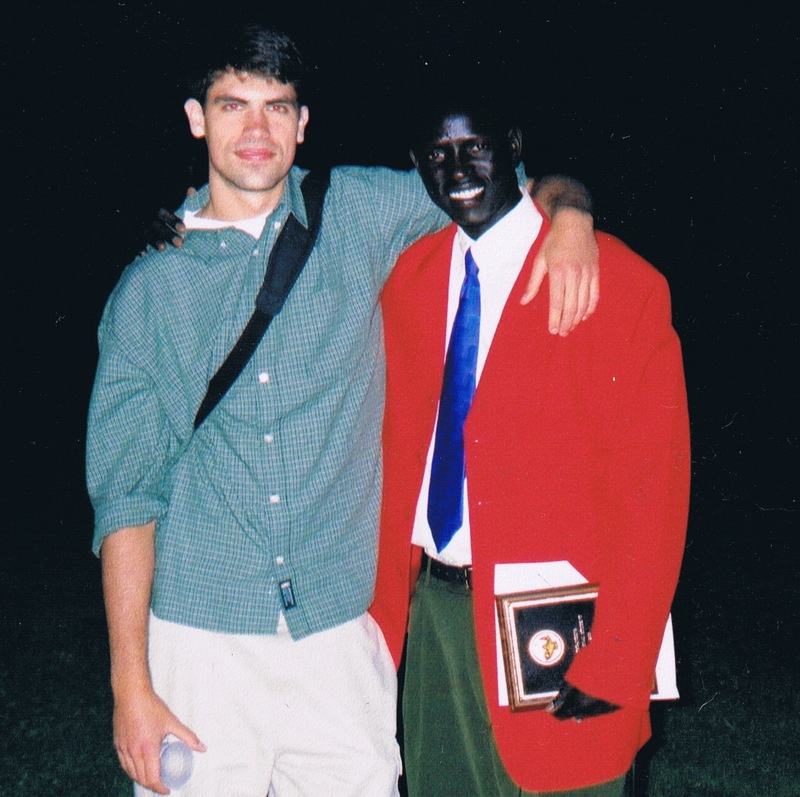 Politics aside, Hubs and I have seen firsthand the resilience and dedication of the Sudanese people through Jimmy and many like him, refugees rescued from the horrors and brutality of war only to take their education and opportunities back to Sudan, to bring their people hope, to actively work toward change. Above all, Learn. Learn what you can about South Sudan and what they are up against. The birth of a new nation, no matter how far removed from our lives, is news indeed, and you’ll be sure to find articles about what is happening in Africa. Watch this video about the annual Peace Olympics held in Twic, Sudan, and meet our friend Jimmy. Sudan is a beautiful country filled with beautiful people. And I’m lucky enough to know one of her most beautiful souls. i love this entry! wish i had known he was speaking at mc…would have loved to have seen him and heard his ongoing story of a redeemed life positioned so highly in his home land. thanks for giving us a window into his life today. The story of a redeemed life…I love how you put that! Indeed! Almost brought tears to my eyes. Jessie, this is beautifully written. I am truly honored to have known him. Thanks, Tiffany! We are so proud of Jimmy and the work he’s doing in Sudan. What a powerful story and powerful video! Thanks so much for sharing. I think my favorite part of that video is watching them play “tug-of-war.” Such a random “sport” but really, who doesn’t love a good game of tug-of-war? I plan on showing it to my students- not sure how I’ll tie into an English lesson, but I will:) They need to see this- so cool that you’re friends with Jimmy! I love tug-o-war! But I was always the one appointed to run up and down the line yelling, “And…PULL!” because my arm strength is imaginary. Here’s a funky connection, maybe? Does your friend Jimmy know Sebastian Maroundit or Salva Dut? Both live in Rochester and if you look at the link, you’ll see that Salva Dut started a “Water For Sudan” program in Rochester in which my son was active for several years. Such a small and interconnected world in which we live — and yet we can’t seem to get it together to just be kind to each other. Awesome! I’ll have to ask Jimmy but I’m sure he does. He knows practically every Sudanese person in America, it seems! Uncle D sounds like a joy to know. My sister and her family are missionaries in Sudan, and you’re absolutely right–it’s a beautiful country full of beautiful people. Yes! My husband and I are hoping to one day travel to Sudan. We’ve got a special place for it since meeting Jimmy and many of his Sudanese “relatives” that found refuge in America. Jess, you never stop impressing. Look at you going all different style of writing like nothing. I remember having a couple of the Lost Boys at the college I teach at. One of them took my class and shared his story with me one afternoon, a similar tale of horror and running for cover as many adults were slaughtered. Powerful stuff. So glad that many of the Sudanese are going back to care for their country. Knowing Jimmy, you would NEVER guess he had witnessed and experienced that kind of terror and violence firsthand. He is one of the kindest, gentlest people I know. And meeting some of the other Sudanese refugees in America through Jimmy, it’s inspiring how gracefully so many of them live their lives. What a great post. It seems so many people go through life wandering, and to read about Jimmy and his purpose-filled life is inspiring. Thank you for sharing it. He is definitely an inspiration. Thanks for reading and commenting! But truly, I’m humbled by the grace and generosity and strength of men like Jimmy and – although you feel blessed to count him as a friend – he is lucky as well to know someone as beautiful and giving as you are. Thank you for telling this story and for doing your part to spread the word. I (in my advancing years – ha!) have found myself questioning what I can do to help others, what gifts I can share. I have (relatively) so much; everything I need plus more. And there are so many who lack the basics for survival let alone comfort, safety, peace. So this post is lovely and thought-provoking and a way to do some good. I am proud to know you, Jess. And to count you as a friend.